Jude and Charlotte’s relationship has grown and developed in Devonport. There is a particular bench that Jude used to come and sit at when he first moved to New Zealand to look out at the beautiful view, and it was this very bench that he proposed to Charlotte on. They got ready in their newly renovated Devonport home (they had had just finished moving in furniture back in a couple of days before the wedding!) They go to church at St Frances de Sales – two minutes walk from their home – and they chose to have their wedding ceremony here. Their reception was at Muchughs on Cheltenham just down the beach from that special bench seat. So it all seemed to fall into place! We loved being able to take their wedding photos in such meaningful places for them. 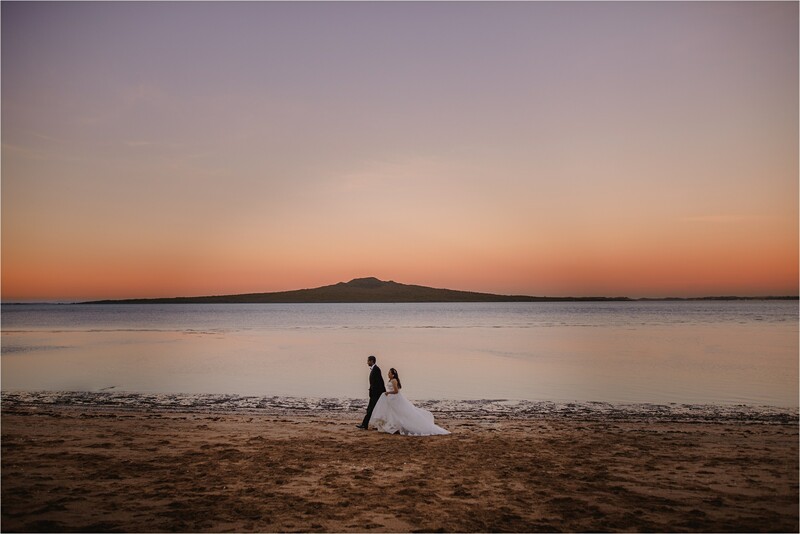 We were blessed with the most beautiful pastel sunset, so we took a few moments out of their reception for Jude and Charlotte to take a breather and enjoy their view together. Jude and Charlotte – we have loved getting to know you guys. Enjoy this sneak peek of the photos.